Elements Applied: Stem or root bark is commonly applied in herbal medicine. It should be collected in autumn or spring. Berries are also useful. Other: contains tannin, resin, and chelidonic acid. History: Barberry has occupied an important place in herbal medicine for almost two thousand years. It was applied to prevent and treat plagues in ancient Egypt. Ayurvedic herbalists applied it for curing dysentery. In the medieval times it was applied in Europe for gallbladder and liver conditions. In Russia it was popular for womb bleeding, elevated arterial tension and inflammations. 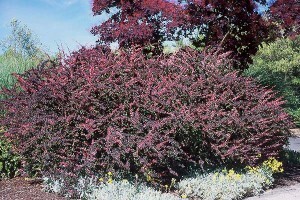 In the early times of America barberry was equaled to Oregon grape. Used for: The remedy improves bile movement, fights constipations, prevents vomiting, and is applied for liver conditions. In Ayurveda the plant is used to stimulate stomach due to its bitter content, to reduce fevers, boost metabolic rates, and prevent fever reappearance. Additionally the herb is applied to kill microorganisms, strengthen the immunity, and decrease arterial tension. According to some researches the plant is potent of reducing tumors. Additionally, it is able to reduce inflammatory processes, but there is less evidence with this regard. Barberry is a quite effective medication which promotes bile movement and helps treat liver conditions. The remedy is prescribed in case of gall stones and inflamed gallbladder. In case of liver congestion accompanied by jaundice barberry is also applied. Due to its bitter taste and mild purgative effect, the herb is applied to promote digestion in patients with weak digestive functionality. Additionally it’s used to reduce inflamed spleen. Barberry is applied in malaria. Barberry is prescribed for boosting liver functionality. It is effective in improving mucus excretion, preventing its accumulation in the area and regulating its levels. The herb induces appetite, improves metabolism, and is additionally applied for gouts. According to Felter, barberry is very much common to Hydrastis, due to which reason it may replace costly chemical medicines. Barberry is believed to widen arteries, which contributes to the fact why the plant is applied to fight hypertension. To purify the intestines apply a teaspoon of root extract, or berries poured into wine. Berry or root extract decoction is an excellent remedy for sore throat or mouth inflammations, if applied as a gargle. Fresh juice taken from the fruit is believed to make the gums healthier, and fight pyorrhea, especially when spread straight over the gums. In Ayurvedic medicine the herb is used for urinary organ and bile disorders, for stomach congestion and relieving Pitta of toxins, arterial tension reduction, renal calculi, body fat elimination, toxin purification, liver functionality regulation, spleen or liver enlargement, jaundice, sores, gastritis and ulcers, malaria, blood purification, fevers, constipation in children or mild constipation, sickness and vomiting associated with pregnancy, skin conditions, recurrent neuralgia, pregnancy symptoms, jaundice, stomach and digestive stimulation, sickness, thirst, heat, brain diseases, scarlet fever, rheumatism, and so on. Additional Info: The herb grows in form of a shrub in almost any garden in Britain and Europe. Especially cultivated in North America. The plant blossoms in mid-spring, to the beginning of summer. The bush can be found in hard soil of northern US regions, and even in the west. The root is yellow-colored, and has a pungent taste. The plant can reach 5 feet in height on average, its stems are red-colored when the plant is young, getting darker as time goes on. The plant blossoms with yellow flowers, which turn into fruits at the beginning of autumn. Berries of red color the plant produces are pleasantly acid, and should be consumed in mature condition only. In form of decoction the plant bark is taken in a quantity of 1 teaspoon for a glass of water and boiled up. The mixture is infused for 15 minutes and consumed thrice a day. In form of tincture the plant is taken in a dose of 1-2 ml thrice a day. Commonly mixed with: To treat gallbladder conditions the plant is combined with Black Root or Fringe Tree Bark. Safety: Not recommended to apply when pregnant, causes uterine contractions. Taken in abnormal quantities, the herb may lead to low pulse and breathing, considerably decrease the arterial tension, provoke convulsions, vomiting, and sickness. People, who are exposed to heart conditions or recurrent respiratory disorders, should not use the plant in high doses, and use it only after having a consultation with a health-care provider. Only recommended dose makes the plant safe. In case of giddiness or weakness, the herb should be quitted immediately. Children of early age (under 2) should not use the medicine. Children of older age and people aged 65 and more should commence with small doses in order to avoid any complications.